Boxelder is a member of the Maple Family. The tree grows to 50 feet in height and to 2.5 feet in diameter. 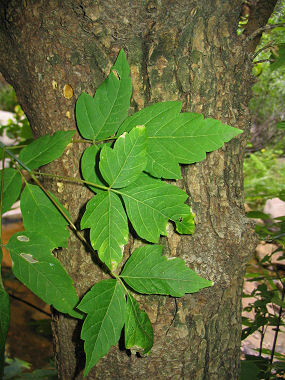 The tree has gray to brown bark which becomes furrowed with age and bright green leaves with 3 to 7 toothed leaflets to 4 inches in length each (the only species of maple with divided leaves). The trunk often divides near the ground into a few long, spreading, rather crooked limbs, which branch irregularly to support a broad, uneven crown. Boxelder grows in moist areas along streams, ponds and lakes in oak woodlands and pine forests at elevations between 3500 - 8000 feet. typically lives for 75 years, with 100 years maximum longevity. Boxelder blooms between April - May and produces clusters of yellowish green flowers to 3/16 inches long. Flowers are followed by pairs of 'V' shaped winged seed cases (called 'samaras') to 1.5 inches in length.